49th Annual Spring Open House: Time For A New RV! 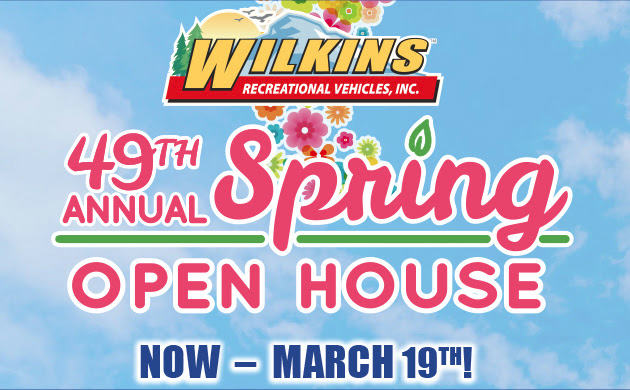 Join us Now-March 19 for the Wilkins RV 49th Annual Spring Open House! Be ready for the start of spring with an amazing deal on the RV of your dreams. For the largest selection at the lowest prices, no one beats Wilkins RV! From Now until March 19th, all Our Wilkins RV Locations will be open everyday, including Sunday. Visit us and take a tour of the wide variety of New RVs and Used RVs available on our expansive sales lot. Our experienced sales associates will answer all your RV questions from towing, to amenities, to type and everything in between. As an extra bonus, Free Roadside Assistance is included with every New RV purchase! Travel with confidence in your new RV, knowing that you’re protected on the way to and from your destination. We have the best selection of new RV brands around, so you can count on finding just the right Travel Trailer, Fifth Wheel or Motorhome to call your RV home away from home. Buy now, pay later! For a limited time, you can take advantage of special sales incentives such as 90 Days No Payments, $0 Down Payments and Financing as Low as 3.99% o.a.c.! Have you seen Wilkins RV’s newest RV additions? New RV brands such as the Cruiser Embrace Ultra-Lite and nuCamp Teardrop Campers are a huge hit and moving fast! Check out these exciting new brands and see the latest in RV innovation for yourself! The Cruiser Embrace offers residential elegance in a half ton towable trailer that is easy to tow and easy to own. Turn heads with a nuCamp T@B or T@G teardrop Travel Trailer. These super lightweight campers open up a whole new world of camping fun for everyone! Contact Us at Wilkins RV for more information about our 49th Annual Spring Open House. Camping season is here! Are you ready?